Fife Flyers players were subjected to video nasties this week as the team reflected on a disappointing weekend in the Gardiner Conference. There was no hiding place for the players as assistant coach Jeff Hutchins forced them to watch footage of their own mistakes in the defeat to Manchester Storm on Saturday and, more particularly, the collapse against Edinburgh Capitals from a winning position on Sunday. And Hutchins is hoping that the video evidence will shame players into ditching their bad habits before it costs the team any more crucial conference points. “We’re not upset that we went into Edinburgh and lost – we’re upset at the way we lost it,” he said. “No game is given because you walk in and put on the gear, but when you go 3-1 up in the first period, and then literally throw it away by falling into bad habits, that’s what we’re upset about and that’s the message we’re going to put across this week. “We’re going to do video after practice and make it evident to everyone where we’re going wrong. Some guys are going to be embarrassed but I think they need to be. “You have to be accountable and you have to realise that good habits and bad habits are contagious, and by taking the decision for yourself, you’re taking the decision for your team mates. 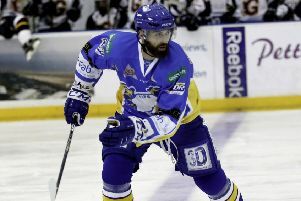 Flyers’ coaches were less angered by the peformance against Manchester - a game Hutchins felt Flyers were unfortunate not to win. “I think if we’d got a goal early on, we’d have won that,” he said. “We’re not looking for excuses, but when you take two centres, and two leading scorers out of your line-up, it can have an effect. “We were zero for eight on the powerplay, and a lot of that was to do with the fact that the powerplay runs through those guys. I think we won one draw on a powerplay in their zone. If you start without the puck it makes it really hard to get momentum. “There’s certainly good reason and rationale why we didn’t have success in that game. “But on Sunday, we score three goals – we have the game in our hands – and we go back to doing silly things that we talk about day in, day out. “We don’t need to score any more. We’ve got a great goaltender back there so if we play solid D, and stay out the box and keep things simple we walk out of there with a victory. Flyers have split their conference schedule into segments and have given the players a points target to work towards, but after four conference defeats in a row, the team are already playing catch up. “Our goal is to win the Gardiner Conference championship and based on results it’s not a pretty picture at the moment,” Hutchins said. “As a coaching staff we’re aware of that, and we talk about changes every week. “Certainly if there were opportunties to make those changes, there probably would be a shake-up. At the moment the market is pretty stagnant. “We can always throw the excuse that we’re short-handed, but excuses aren’t going to win you the conference. Sometimes you have to persevere. Flyers travel to Manchester on Saturday to face a Storm side that they have failed to score against in six periods of hockey - in contrast to a 7-0 home win earlier in the season. Flyers then return to Kirkcaldy to face Braehead Clan as they try to snap a three-game losing streak against their biggest rivals. “In terms of Manchester, we have to go in there and just be hungry,” Hutchins said. “Something we didn’t do well on Saturday was we didn’t go to the net well - we made it too easy for the netminder. “We need get off the bus and leave it out there on the ice, worry about getting two points then come back to Braehead and try to solve them. “I’ve no doubt if we play a better defensive game we can beat them. I think we’ve got a pretty good up and down line-up against them – the last time was more our fault we didn’t beat them rather than them playing well. Ryan Dingle’s injury comeback remains day-to-day but Hutchins was hopeful to have him available for the weekend. Matt Sisca is due to return this week after flying home for personal family reasons, and he will be assessed before being considered for selection.